Where Did All of That Money Come From? This is blog post is to fulfill my promise regarding the newspaper clippings that I found in the letter of Mrs. E.L. Chapman (see previous post, dated 21 November 2014). After her death in 1918, Mary E. Day left over $14,300 in bequests to various people and institutions, in spite of having never had any type of career. But who was Mary and where did she get all of that money? Mary E. Day was born 4 Nov 1847 to Mary C. Griggs and Isaac C. Day in Killingly, Connecticut, where her father, Isaac was a Congregational Minister. She had one brother, Albert who was born 17 May 1849. By 1860 the family had moved to Providence, Rhode Island and her mother and father were running a sizeable boarding house with real estate valued at $1000.00. It appears that she lived all of her adult life with her father and brother, after the death of her mother in 1874. By 1900, Isaac and his adult children, Mary and Albert lived at 20 Whitmarsh Street in Providence. After the death of their father in 1906, Mary and her brother, who worked as a treasurer for an Iron and Steel Corporation his entire career, continued to live in the same family owned home in Providence. Albert died 13 Jun 1913. Both Mary and Albert never married. I suspect that Mary, the last living survivor in the family, inherited everything and kindly arranged for its donation when she died. She died 31 Dec 1918 in Providence, Rhode Island at the age of 71 and is buried in Swan Point Cemetery in Providence along with her parents and brother. 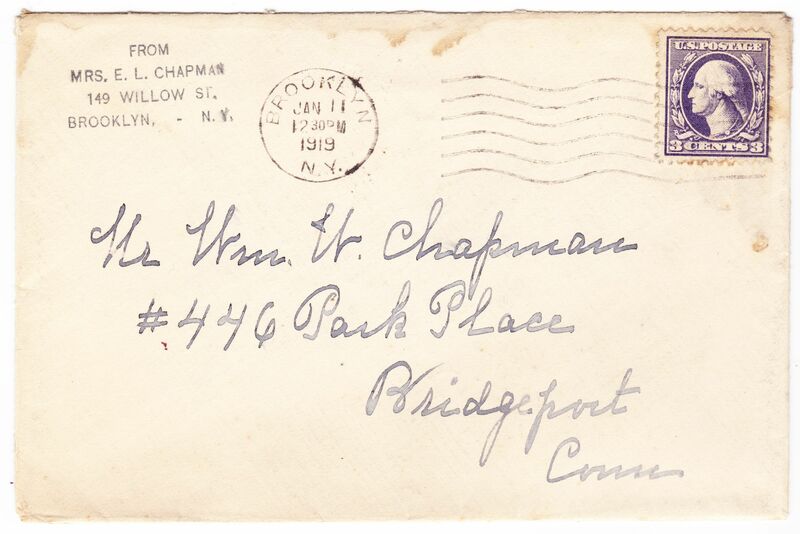 In my previous blog post about Mrs. E. L. Chapman, I mentioned that there were two newspaper clippings that she had included in the letter to her son. (I know, I know – it’s been a while since I posted to my blog.) This post is about one of those clippings. Born in Utica, New York on 30 January 1893, Glenn was the son of Charles Wicks and Lucie Canterbury Glenn. Glenn’s father was a manufacturer and the family was of some means as they had two Irish servant girls living in the home in 1900. By 1915, Glenn’s father, Charles, was a State Senator in New York. Of medium height with a slender build, Glenn had brown eyes and black hair. He was 24 years old in June of 1917 when he registered for the draft. During his second year at Yale he enlisted in the Aviation Section and became a First Lieutenant in the 17th Aero Squadron in the Army Air Corps. Flying his Sopwith Camel, Glenn successfully shot down a German plane and was credited with being the first in his unit to achieve this accomplishment. A skilled pilot, he participated in a number of missions. On 5 October 1918 while flying on a mission to bomb German ammunition dumps over France, his plane collided with that of Lieutenant Harold G. Shoemaker. 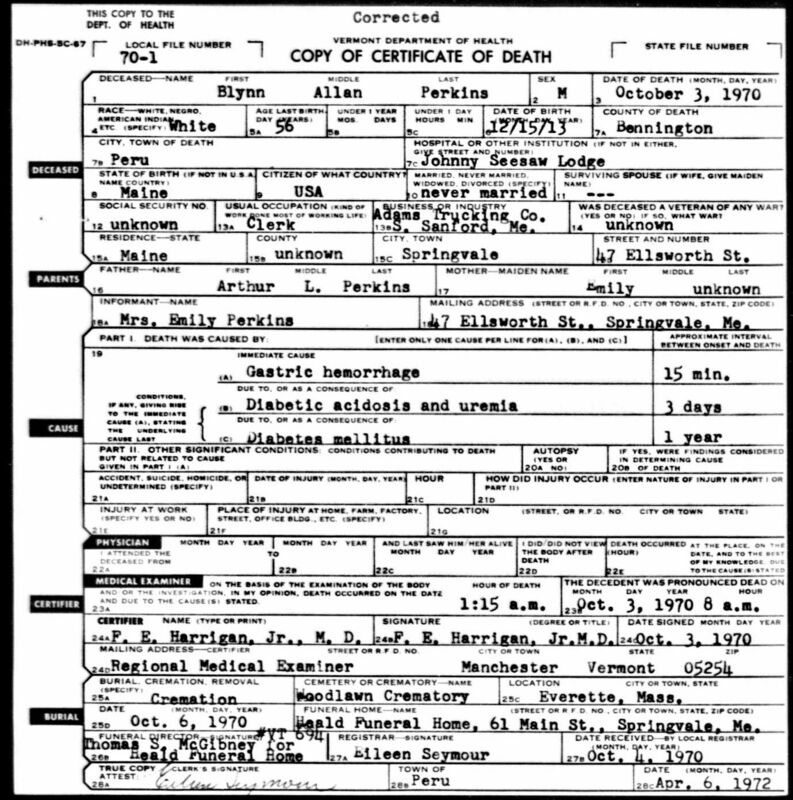 It was reported that the plane “was seen going down behind German lines in a tailspin.” When he was reported missing his father, the Senator, immediately applied for a passport to go to France, his son’s fate unknown for several weeks. It was later determined that both men had died. Glenn was 25 years old. The flying field established in Utica, New York was named the Glenn D. Wicks Field in his memory. He is buried in the Somme American Cemetery, Plot A Row 24 Grave 8, in Bony, France. He left behind his parents and a brother, Roger, 2 years his junior. Who was Mrs. E.L. Chapman? My birthday is ended and it was a bright sunshiny day, and I enjoyed every moment. The day was full of surprises. 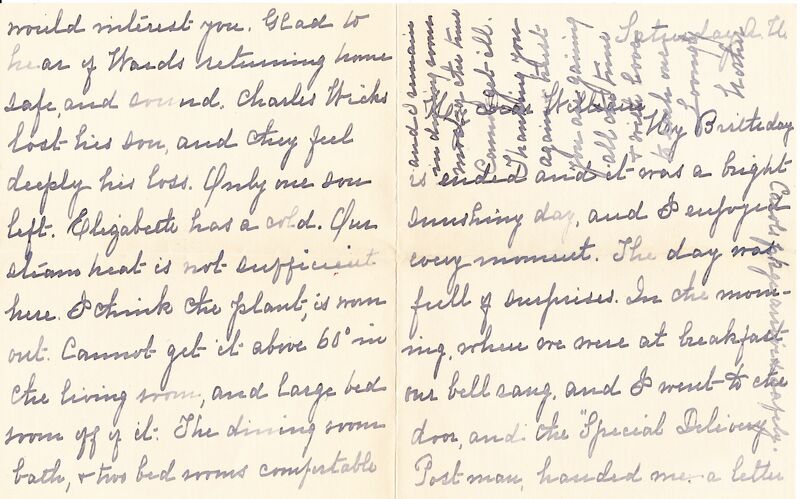 In the morning, when we were at breakfast our bell rang, and I went to the door, and the “Special Delivery” Postman handed me a letter and I recognized the hand writing as Horatio’s a Birthday greeting, and a check for ten dollars. At nine oclock our regular postman came, and filled my two hands with letters. 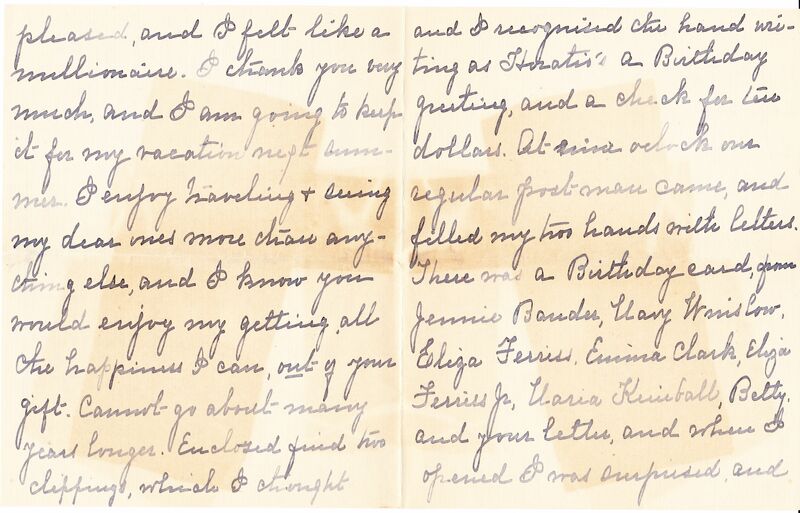 There was a Birthday card from Jennie Bander, Mary Winslow, Eliza Ferris, Emma Clark, Eliza Ferris Jr, Maria Kimball, Betty and your letter and when I opened I was surprised and pleased, and I felt like a millionaire. I thank you very much, and I am going to keep it for my vacation next summer. I enjoy traveling and seeing my dear ones more than anything else, and I know you would enjoy my getting all the happiness I can out of your gift. Cannot go about many years longer. Enclosed find two clippings which I thought would interest you. Glad to hear of Wards returning home safe, and sound. Charles Wicks lost his son and they feel deeply his loss. Only one son left. Elizabeth has a cold. Our steam heat is not sufficient here. I think the plant is worn out. Cannot get it above 60⁰ in the living room, and large bedroom off of it. The dining room bath & two bedrooms comfortable and I remain in dining room most of the time. Cannot get ill. Thanking you again and trust you are gaining all the time & with love to each one. But who was Mrs. E.L. Chapman? She was Eliza Lincoln (Dickinson) Chapman born 10 Jan 1838 in Connecticut, the daughter of Nancy Lincoln who was born between 1808 and 1810 in Massachusetts and Rufus Wells Dickinson who was originally from Hadley, Massachusetts. She married William Hiscox Chapman, on 21 November 1857. He later served and was wounded in the Civil War in Spotsylvania, PA. He died 3 October 1879 at the age of 46 (she later received a Civil War pension for his service). Eliza and William had three children: Eliza Lincoln born 7 Feb 1861, William Wells born 11 July 1863 (to whom the letter was addressed) and Horatio Campbell born 23 November 1867. Eliza never remarried. She died 19 December 1928 and is buried with her husband in River Bend Cemetery in Westerly, Rhode Island. 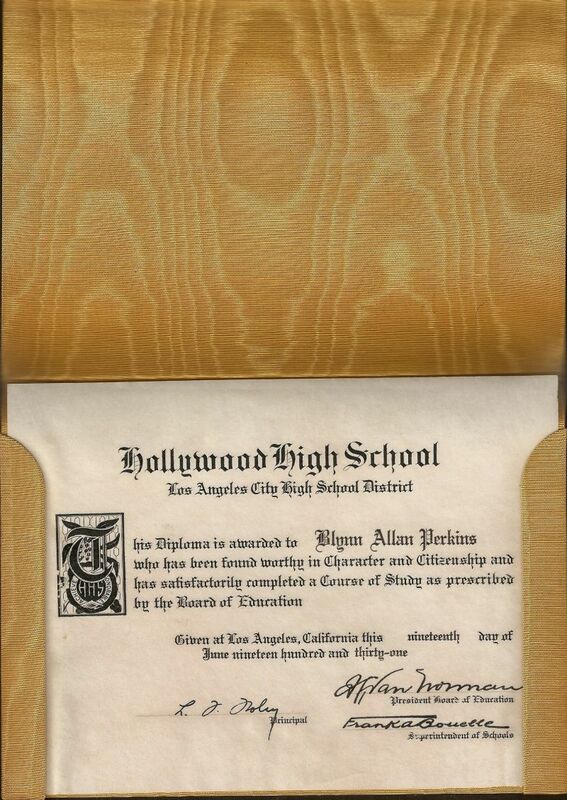 The graduate was Blynn Allan Perkins, who was born and died in Maine. 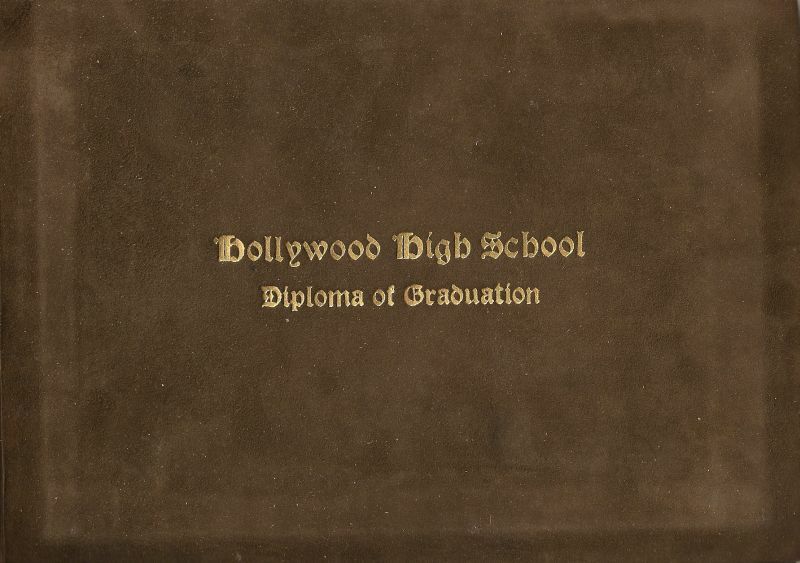 So why did he graduate from high school in Hollywood? Blynn Allan Perkins was born December 15, 1913 in Maine. In 1920, his father, Arthur worked in a plush mill and his mother Emily (who was born in England) was a mender in a worsted mill in Sanford, Maine. In 1928, Blynn’s father, Arthur died and his mother took a job as a dressmaker for the motion picture industry and moved to Beverly Hills, California with her teenaged son. 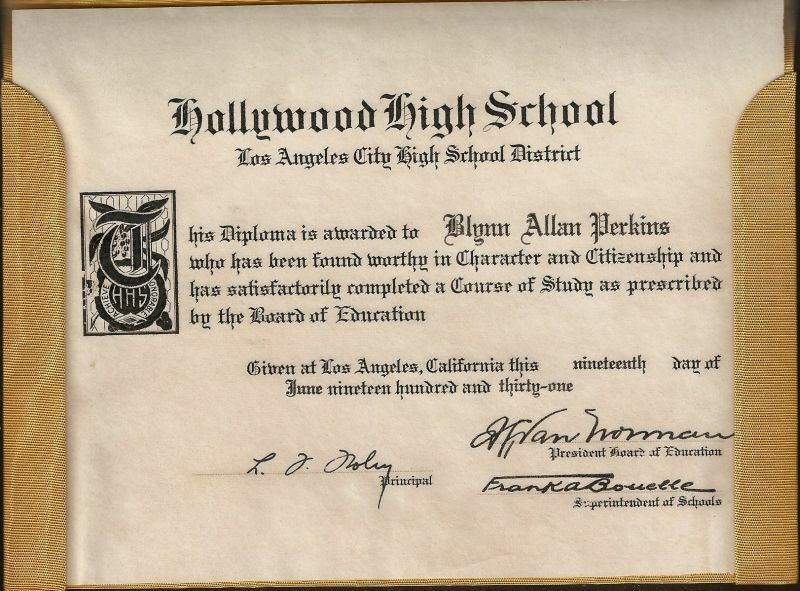 Blynn graduated from Beverly Hills High School in 1931. By 1940 he was living in Manhattan with his widowed mother. She was working as a secretary for an actress; he was an unemployed movie house musician. On April 8, 1942 he enlisted in the United States Army at Fort Jay Governors Island, New York and served as a Corporal in the 3rd Reconnaissance Group during World War II. Blynn died, at Johnny Seesaw Lodge in Peru, Maine on Oct 3, 1970 of complications from diabetes at the age of 56. He had returned to Maine and was working as a clerk for a trucking company in Sanford, Maine. He was an only child, who never married and he had no children.